Can Tunisia’s Democracy Survive Terrorism? Some Tunisians fear that the government’s proposed solution to deal with violent radicals will undo the victories of the 2011 revolution. The Tunisian government’s response to the attack on tourists at a beach resort in the eastern city of Sousse on Friday has focused on security forces and ideological combat. But the Tunisian left argues that the government’s proposed solution to dealing with a tiny fringe of violent radicals will undo the victories of the 2011 youth revolution with regard to freedom of expression. Further, they assert, the government needs to deal with the social and economic roots of a turn to terrorism among a small group of Tunisian young men, and mere securitization will not address the underlying issues. Friday’s horrific assault was the second of its sort this year. In March, nearly two dozen tourists were killed at the Bardo Museum. 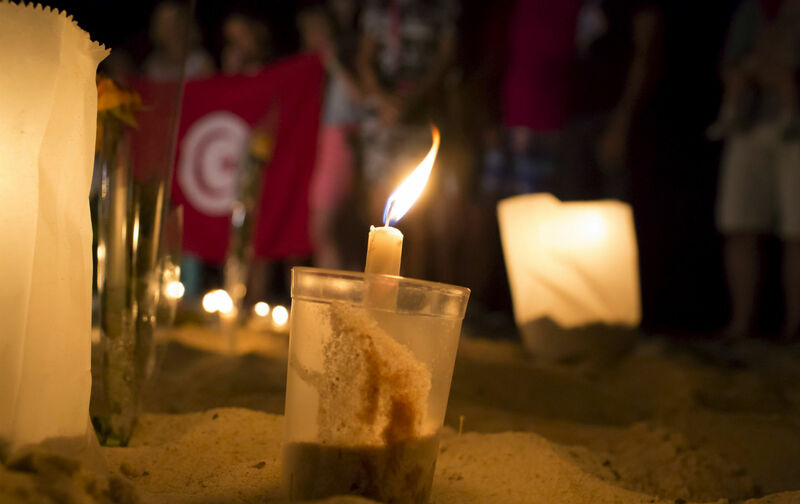 Although the so-called Islamic State group (known in Arabic as Daesh) claimed to have been behind both massacres, Tunisian security forces see them as the work of local North African extremists. If you count everything involved in tourism, from air tickets to hotel stays to shopping in the local markets, it could amount to 15 percent of the Tunisian economy. These terrorist operations are therefore intended to throw the economy into a tailspin and to harm government revenues, softening up the state for a violent overthrow. The so-called Islamic Group (al-Gamaa al-Islamiya) pursued a similar strategy in Egypt in the 1990s, but it backfired when public revulsion dried up recruits for the extremists and the government resorted to mass incarceration, jailing an estimated 40,000 people, many for thought crimes. The Egyptian Gamaa thereafter gave up violence. The perpetrator, Saif al-Din al-Rizqi, hails from the impoverished village of Gaafour (population 9,000) in agricultural Siliana, southwest of the capital. He appears to have been recruited by a radical vigilante cult when he went to study engineering at the provincial University of Kairouan (a southern desert city known for being a hotbed of the religious right). His circle included recruiters for what they see as a holy war in Syria, and al-Rizqi himself defended holy war on his Facebook page. He, like many on the religious far right, dismissed last fall’s parliamentary elections as having been rigged. He also was active since late May in the demonstrations and protests of the popular movement “Where is our Gasoline?”—fueled by a conspiracy theory that charged that Tunisia has lots of potential oil wells but the government is either incompetent or is deliberately not exploiting them. Recently the demonstrations have turned into violent clashes with police. Tunisian liberals and leftists fear that the radicals are giving ammunition to authoritarians in the elected, secular government of Beji Caid Essebsi, which springs from the Tunisia Call Party. (The Carter Center certifies that the government won fair and square in a free and transparent election). Tunisia Call comprises the urban middle classes and the wealthy, who fear Muslim fundamentalism. Some of its constituent factions had been tied to or done well under the deposed dictator, Zein El Abidin Ben Ali, and the party’s critics see it as angling to roll back some of the new liberties achieved in the past four years. The ruling party has, for instance, introduced legislation that bans assaults on police and security forces and which includes “denigration” as a form of attack. It also imposes steep penalties for whistleblowers who reveal “state secrets,” which apparently would include police misconduct. In the summer of 2013, rapper Weld El 15 was charged for lyrics that, the state prosecutor insisted, instigated violence against police. He was ultimately acquitted, but the result might not have been so happy under the new law. Among the government of Prime Minister Habib Essid’s immediate responses to the beach massacre has been to close some 80 unlicensed mosques around the country, where the sermons were not approved by the government and which are accused of preaching hateful values. (The Sousse shooter was said to have seen the beach resort as a den of iniquity, a puritanical point of view typical of the hard-line Salafi sect). He said that organizations opposed to the new 2014 constitution would be admonished and then closed down if they continued to agitate against it. (Ironically, the constitution guarantees freedom of conscience). He also intends to bring in the army to back up police in dealing with radical vigilantes. He spoke of declaring some Western mountainous regions where radical Muslim guerrilla groups are operating “military zones” that would be off-limits. Many radicals come from the impoverished villages in the west and south of the country, in the prosperity of which the Tunis elites have shown little interest, or from the slums of Tadamun in Tunis itself. In working-class and slum districts of the capital, Salafi puritanism plays a role similar to that of evangelical Christianity in the favelas of Rio de Janeiro. The danger is that Paris and Washington will also see Tunisia solely through the lens of security and terrorism. The country will take a huge hit in its vital tourism industry this year. It needs investment and civilian foreign aid, not military equipment.